Large - $69.99 X-Large - $69.99 Only 5 left! When we first saw this costume in the office, we were blown away and a little puzzled. First of all, we didn't think it was possible for a human to look so much like an insect. And not just any insect, but one of the rarest arthropods of all time: the Praying Mantis. We did a lot of research on the unique creature because, well, they're really fascinating and fun to learn about. Basically, we concluded that the Praying Mantis is a mix between an alien, a bug, and a carnivorous beast! To sum up our research in the most simple way possible, the Praying Mantis should not be messed with. They're basically the gangsters of the insect world! We saw videos of them unleashing a whooping on an array of other bugs. One went two-to-two (or arthropod leg to arthropod leg?) with a wasp, a wolf spider, a black widow, and even a snake! We even watched one of these brutes jab a cat in the face before making an epic getaway. It was awesome! 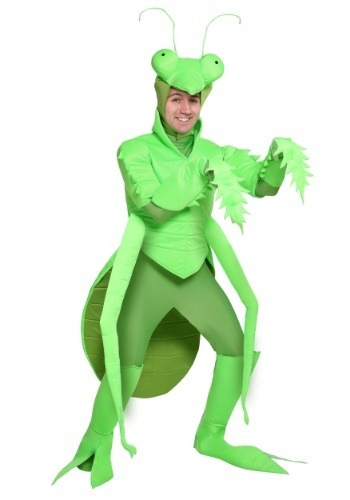 If you think you've got the grit to be one of the top predators in the bug game, then wearing our men's Praying Mantis costume is a wise choice. 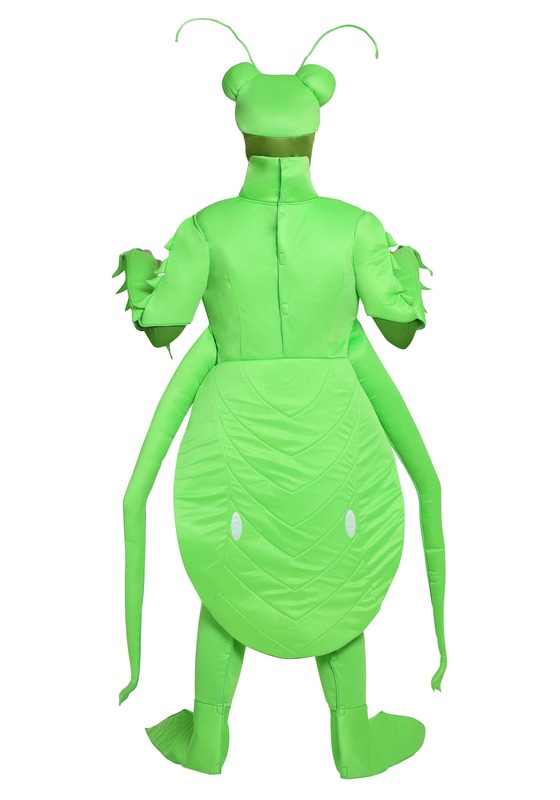 No bee, beetle, or butterfly would dare bug you when you're wearing the green spandex jumpsuit and the coordinating tunic. The tunic features a thorax, abdomen, and legs while the headpiece fastens under the chin. Finally, put on the boot covers and congratulations, you have just transformed into the Chuck Norris of the insect world!